Quality: Excellent Vhs transfer with full custom artwork. Note: Complete mini-series on one dvd. The best quality you'll find on the web. This was transferred from UK format PAL tapes and is of higher quality than any NTSC transfers. Historical epic following US army officer George Custer's role in the Indian Plains Wars, and the rise of his eventual nemesis, the Native American war leader Crazy Horse, who was inspired by a vision to lead his people to freedom. As conflicts erupt and treaties are broken, the two men are drawn into a final confrontation at the Little Big Horn. Starring Gary Cole, Rodney A Grant and Rosanna Arquette. 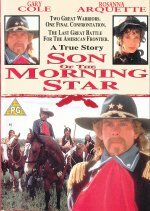 This account of Custer is recognised as the most factually correct portrayal in any movie.